No more excuses guys! Urban Gent Esq. Manicure Grooming Set will give you that professional look at a fraction of salon price. 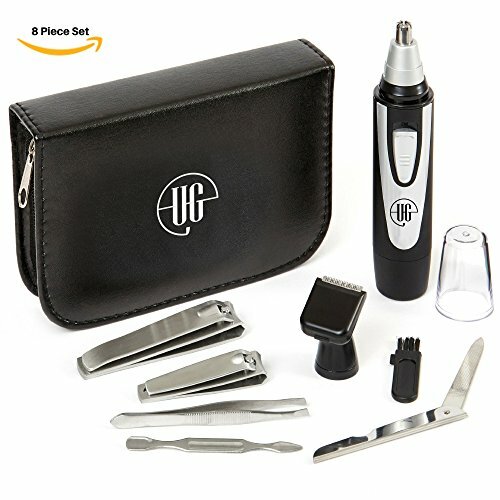 The ultimate trimmer that removes hair from 5 prominent places: ears, nose, eyebrows, sideburns and beard. Requires 1 AA battery (not included). The oscillating trimmer head ensures each hair is trimmed without 'tug of war' motion. The beard trimmer delivers a precise groomed look with its stainless steel dual edge blades. To keep clean, remove detachable nose and hair trimmer or beard trimmer head and run head under running water. Remove hair from the trimmer with cleaning brush (included). Buy with confident as we offer you 2 year Warranty. If you're not satisfied, we'll give you a full refund - no questions asked. Achieve professional results today and click 'Add to Basket' now!